It's official, Orange Door Kitchen construction is underway! Currently in Week Three of our twenty-ish week project, things are progressing as planned with only a few bumps in the road. Before I go further into detail of what's happening on site, allow me to introduce you to the team: Brian and Mike from M&M Home Services are leading the charge as our general contractors. On top of overseeing all of the subcontractors on site, they're doing everything from demolition to carpentry to millwork installation and other finish work. Great Spaces Inc, our next door neighbor and kitchen and bath designer, is on board for cabinetry and countertop coordination. The crew from Flannery Plumbing and Heating are working on the pipes for plumbing and gas (two key ingredients in a commercial kitchen build-out), while the team from Three Phase Electric are pulling wire for lighting and power and making sure that our fire alarm system is in tip top shape. East Coast Fire Protection will be on the job to tailor our kitchen's fire suppression system to the new layout of cooking equipment. When we're ready for finish-level work, Union Painting will be plastering and painting, and PR Floor Covering will be laying our hardwood floors in the front of house while McClean Flooring Solutions will bring in a team to pour an epoxy floor in the commercial kitchen. We're thrilled that all of these hands will take part in bringing our vision for Orange Door Kitchen to life! As soon as we signed the lease on the building in July, Chris and I started little bits of demolition to make the space feel like ours. Over the course of a few months, we removed signage, trash and finishes, and dismantled the partial height walls and the millwork bar in the main dining area. In November, as the design was nearing completion, we convinced family and friends to help us make a big push to fill a construction dumpster with everything from framing to flooring in hopes of making the demolition for Brian and Mike as easy as possible. Thank you so much to everyone who lent a hand - we couldn't have accomplished our goal without your time and elbow grease! Take a walk with me through our building on the day before Brian's team started their official demolition! Even though we paved the way for their work, I was still shocked at the speed and efficiency of the M & M demo crew! In Week One of the job, a few days of swinging sledge hammers and ripping stuff down completely transformed the space, getting it ready for layers of new construction. Demolition uncovered a steel column in the way of our intended door location to the commercial kitchen, so we worked with Studio InSitu to solve our way out of that pickle. Week One - Demolition is underway. We removed the wall creating the bathroom hallway to enable us to rebuild it to code. Week One - We uncovered a steel column in the way of what we hoped to make a bigger door opening. 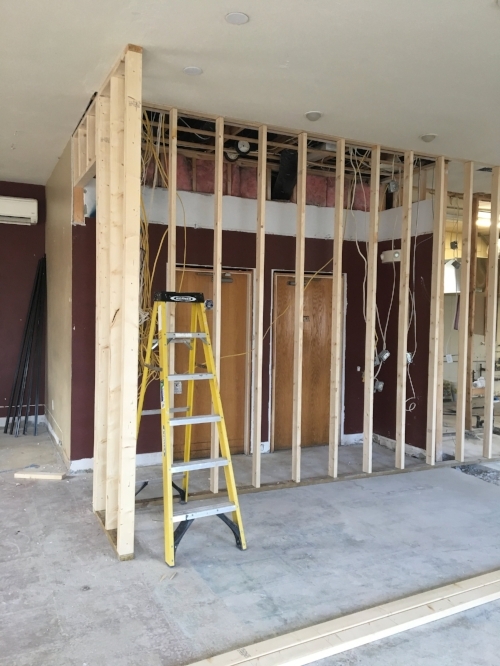 In Week Two, we saw the framing for new walls and soffits go up and start to shape the flow of how people move throughout the building. Instead of walking into one big open space, we now have the beginnings of a Foyer, Chef's Gallery, Demonstration Kitchen and Dining Room! Having worked on light gauge steel frame job sites in the past, the site and smell of freshly sawn 2x4 wood frame construction is so much more tactile and satisfying to walk through. When life is as busy for us as it is right now, I'm finding it important to savor and enjoy the little things! Week Two - Framing in progress. This is the back wall of the Demonstration Kitchen...and the bathroom hallway is now 2" wider! Week Two - Framing creates more space in the Commercial Kitchen for small businesses to work side by side. Following a couple of days off for Christmas, Week Three was dominated by concrete trenching and rough plumbing installation. The Flannery plumbing crew came in from the cold with a lot of man-power to complete the work for our upcoming rough plumbing inspection. They flew along without the assistance of engineered plumbing plans, and as far as I could tell, the pipes that they installed look fantastic. 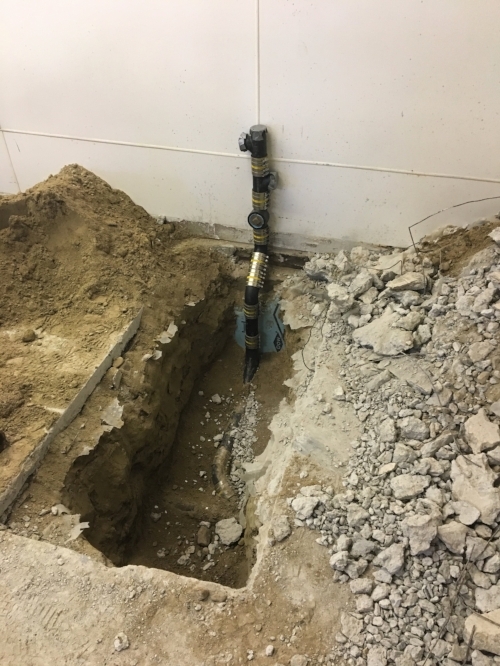 The trenching associated with installing new plumbing in an existing building is nothing if not epic. It's a shock to walk into your building to see piles of dirt where there should be clean concrete slab. As Brian says, "things are going to get ugly before they get fixed up." With the exception of the exposed copper pipes, the site was indeed fairly ugly in Week Three. But Week Four holds the promise of passing rough electrical and plumbing inspections which will allow Brian and Mike to close up the walls, fill in the concrete trenches and begin the next phase of finish work. Week Three - Framing continues with soffit and closet construction. You can see that we're starting to shape and define spaces. Check out those pipe cutters on the floor in the foreground. They provide enough leverage for one guy to cut through the heavy duty metal pipes nearby! Week Three - Trenching for plumbing is underway. It's unnerving to see an existing floor all dug up, but this mess is a critical part of the project. Less than a month into construction, we're so pleased with the progress that the job-site crew is making. We couldn't be more excited to see our vision unfolding before us and, despite a few hiccups along the way, we are looking forward to the next few months of watching the old restaurant turn into Orange Door Kitchen - a new culinary studio and shared commercial kitchen for West Acton and surrounding towns!